Vitamins (figure 1) are defined as essential organic compounds your body needs in limited amounts to remain healthy. These compounds must typically be obtained through the diet because your body is unable to produce sufficient amounts of them. 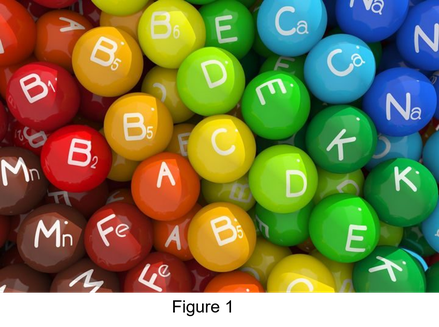 Vitamins display a variety of biological functions, ranging from enzyme cofactors to antioxidants and regulators of cell differentiation. For example, most B-type vitamins or their precursors are utilized as cofactors, including vitamin B12 or cobalamin. In fact, it is a complex water-soluble organic compound, containing the rare metal cobalt. The presence of cobalt in vitamin B12 cofactors endows enzymes with the capacity to catalyze a vast array of chemical transformations, including isomerizations, methyl transfers and dehalogenations (1). Vitamin B12 is an essential compound for humans and is crucial for proper functioning of the nervous system as well as red blood cell formation. Its important role is underscored by the fact that a shortage of vitamin B12 strongly affects the brain and nervous system, resulting in potentially irreversible damage (2). Clinical manifestations include fatigue, depression and poor memory. Two vitamin B12-dependent enzymes have been identified in humans, namely methionine synthetase and methylmalonyl-CoA mutase. The first enzyme is involved in the metabolism of amino acids and fatty acids, while the second enzyme catalyzes the last step in the synthesis of methionine (1,2). Vitamin B12 is one of the largest non-polymeric compounds found in Nature that is produced by a limited set of bacteria and archaea, while animals and protists require it but are unable to synthesize vitamin B12. Plants and fungi, on the other hand, have evolved cobalamin-independent processes (2). About 30 microbial enzymes are needed for the biosynthesis of vitamin B12. The enzymes that catalyze the major steps in the production of cobalamin have been well established, while the mechanism by which the final compound is assembled is poorly understood. Recently, a novel bacterial enzyme, known as BluB, has been identified in a genetic screen that plays a key role in the final steps in the biosynthesis of cobalamin (3,4). BluB shares homology with members of the NADPH/flavin-dependent oxidoreductase family. Despite its ability to bind FMNH2, it is not used as cofactor by BluB. Instead, FMNH2 is used as substrate for production of the lower ligand of vitamin B12, called dimethylbenzimidazole (DMB), through a unique and complex transformation. Hence, BluB represents a novel and fascinating DMB synthase. Here, I will discuss the biochemical, mechanistic and structural properties of BluB. Cobalamin was first isolated in 1948 by Folkers and Smith (5,6) and its structure was elucidated a few years later. This is shown in figure 2 (adopted from 3) and reveals the complex nature of this cofactor. Structurally, B12 is made up of three components: the corrin ring, the nucleotide loop and dimethylbenzimidazole (DMB). The corrin ring is the largest component and contains cobalt. Two different upper ligands, deoxyadenosine or a methyl group (R), can be attached to the corrin ring. This yields two biologically active B12 variants known as adenosylcobalamin and methylcobalamin, respectively (2). 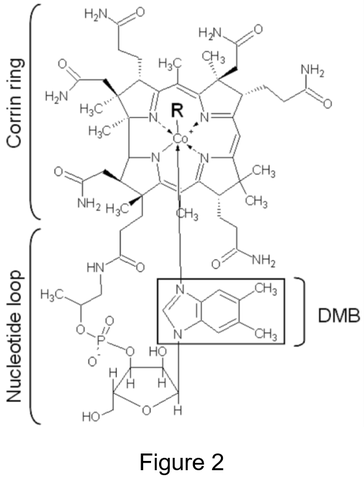 DMB comprises the lower ligand and is attached to the corrin ring through the nucleotide loop. During the biosynthesis of B12, all components are produced individually and are subsequently assembled. Interestingly, analysis of B12 production in different bacteria showed that cobalamin can be produced through either an aerobic or anaerobic biosynthesis pathway with each pathway comprising about 30 enzymatic steps (2). When synthesized aerobically, cobalt is inserted late during biosynthesis, while under anaerobic conditions cobalt is inserted early during production (2). The mechanism by which DMB is synthesized is not well understood. However, it has been established that this requires FMN and oxygen (2). Insight into the way DMB is produced was provided unexpectedly by recent genetic screens aimed to isolate Sinorhizobium meliloti cells defective in the synthesis of extracellular polysaccharides (3). This approach resulted in the identification of an S. meliloti gene homologous to the bluB gene of R. capsulatus, which has a reported role in the final steps of B12 biosynthesis (7). Characterization of S. meliloti mutant cells devoid of BluB showed that the protein is essential for cell viability. Growth is, however, restored when B12 or its precursors are added to the medium. Moreover, accumulation of the final cobalamin precursor (GDP-cobinamide) was observed in these bluB mutant cells. This suggests that within this mutant B12 biosynthesis proceeds until the last step, the attachment of DMB to the corrin ring as lower ligand (3). Combined, these data point towards a key role of S. meliloti BluB in the biosynthesis of B12, such as the production of DMB. BluB is a cytosolic protein of about 26 kDa and shares homology with members of the NADPH/flavin-dependent oxidoreductase family such as flavin-containing monooxygenases. These enzymes use NADPH to reduce FMN or FAD and subsequently employ the reduced flavin cofactor (FMNH2/FADH2) to catalyze a variety of redox reactions (8). Characterization of the reaction catalyzed by BluB showed that it is able to bind FMNH2, although this is consumed to form DMB in a reaction that requires oxygen (3). Hence, FMNH2 is not used as cofactor by BluB but as substrate to produce DMB, which requires oxidative fragmentation of the substrate. Moreover, NADPH is not used as coenzyme by BluB but it is needed to reduce FMN in solution. Collectively, this shows that, despite homology to members of the NADPH/flavin-dependent oxidoreductase family, BluB is not a true flavin-dependent reductase and probably relies on a separate reductase for the formation of FMNH2. 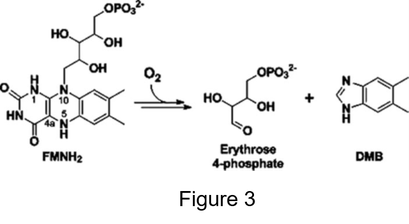 A detailed analysis of the reaction products showed that D-erythrose 4-phosphate (E4P) is the major byproduct of the BluB-catalyzed reaction, which is schematically shown in figure 3 (adopted from 9). Mechanistically, this reaction is, however, not straightforward because the fragmentation of FMNH2 requires cleavage of its ribitol phosphate tail. To further the mechanistic understanding of FMNH2 fragmentation, the crystal structure of BluB bound to FMN was solved at 2.3 Å resolution (REF). The structure of the dimeric enzyme is shown in figure 4 (with one protomer in magenta and the other in blue), revealing an overall structure (upper left and right panel) which is similar to that of NADPH/flavin-dependent oxidoreductases. 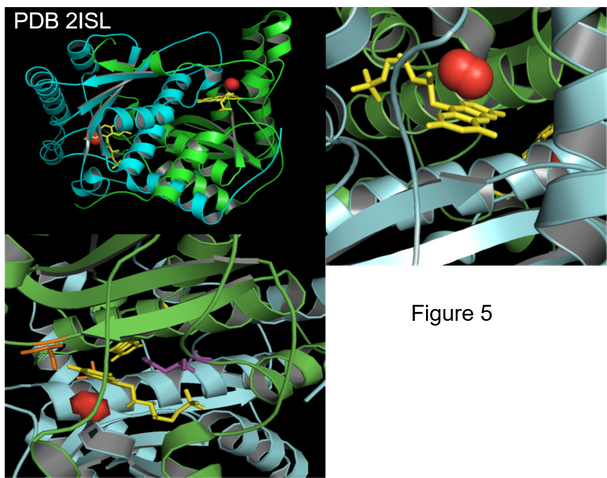 Moreover, BluB contains a lid domain (in green) that completely buries FMN, shielding the active site from solvent. FMN is shown in yellow and residues that make up the FMN-binding domain are in orange. The active site is buried inside the protein’s core and has a strong electropositive character. Both the lid domain and FMH-binding region surround the active site, contributing to its rigidity. Thus, BluB possesses a closed, solvent- inaccessible active site. Apparently, accessibility to the active site is controlled through gated entry provided by flexibility within local structural elements within helices that surround the active site (10). Moreover, functionally important residues were identified in a recent genetic screen aimed to isolate loss-of function mutants of BluB (9). It was found that many mutations that impair enzymatic activity are localized to residues within the FMN and lid region, which are shown as spheres in the bottom panel of figure 3. Most mutations affect BluB’s affinity for FMH, while other mutations reduce the structural stability of the active site, revealing the sensitivity of the active site to structural alterations. Of particular interest are asp32 and ser167 because both residues are conserved in all BluB homologs and although replacement of asp with asn or ser with gly dramatically affects the affinity for FMH2, it does not abrogate flavin binding but it does block BluB’s function (9). A deeper understanding into the catalytic role of asp32 and ser167 was obtained through the crystal structure of BluB containing FMNH2 and molecular oxygen at 2.9 Å resolution (10). This structure is shown in figure 5 with FMNH2 in yellow and molecular oxygen as red spheres, revealing that oxygen is anchored into the active site by two hydrogen bonds from gly61 (upper left and right panel). Oxygen is thereby ideally placed to attack C4a of the flavin backbone to form a peroxyflavin intermediate. Indeed, analysis of the BluB-catalyzed reaction by stopped-flow spectrophotometry confirmed that oxygen attacks C4a, resulting in an peroxyflavin intermediate (11) similar to what has been established for flavin-dependent monooxygenases (8). A close-up of the active site with asp32 in purple and ser167 in orange (lower left panel) shows that both residues are situated near oxygen. Moreover, asp32 is in close contact to C1 of the ribitol phosphate tail and N1 of the isoalloxazine ring, while ser167 forms an H-bond to N5 isoalloxazine ring. Interestingly, replacement of asp32 by asn or ser167 by gly does not affect the formation of a peroxyflavin intermediate, while the flavin destruction phase of the reaction is inhibited by these substitutions as evidenced stopped-flow spectroscopy (11). Conceivably, these residues play a crucial role in the fragmentation of FMH and thereby preventing it from being used as cofactor. Although the precise mechanism of flavin destruction by BluB is as yet unclear, it has been established that decay of the peroxyflavin intermediate drives the destruction of flavin. Owing to its unique chemical properties, flavin is utilized as cofactor by many enzymes to catalyze a wide variety of redox reactions, such as: aromatic hydroxylations, Baeyer-Villiger oxidations and dehalogenations (8). Flavin-dependent enzymes use either FAD or FMN as cofactor, which are derived from riboflavin. During the catalytic cycle of flavin-dependent enzymes, FAD and FMN shuttle between oxidized and reduced forms. FAD and FMN are typically reduced by coenzymes such as NADH and NADPH. To reduce FMN or FAD, a separate reductase may be used or this activity resides with the flavin-dependent redox activity on a single polypeptide (8). In addition to its established role as cofactor, evidence is accumulating that FMN is used as substrate for the production of DMB during B12 biosynthesis. This unique reaction requires fragmentation of the flavin and is catalyzed by BluB. Hence, this enzyme has been termed “DMB synthase”. 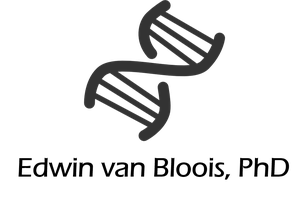 B12 biosynthesis is almost exclusively performed by a subset of bacteria and archaea and it is therefore not surprising that BluB homologs are prominent in prokaryotic genomes, which is in line with its essential role in B12 biosynthesis. BluB was identified in a genetic screen aimed to isolate Sinorhizobium meliloti cells defective in the synthesis of extracellular polysaccharides (3). Subsequent characterization of the mutant cells unexpectedly implicated BluB in the biosynthesis of B12 and in particular the production of DMB. BluB shares homology with members of the NADPH/flavin-dependent oxidoreductase family and is able to bind FMNH2, although it is not used as cofactor. Rather, FMNH2 is fragmented during the catalytic cycle of BluB, yielding DMB and D-erythrose 4-phosphate (figure 3). It has been established that the catalytic cycle starts with the formation of a peroxiflavin intermediate similar to what has been reported for flavin-dependent monooxygenases (8). However, subsequent decay of the peroxyflavin intermediate drives the destruction of flavin by a poorly understood oxidative mechanism. Hence, BluB is a unique enzyme which shares homology with members of the NADPH/flavin-dependent oxidoreductase family but is distinguished from these enzymes by the presence of active site residues asp32 and ser167, which enable BluB to fragment its FMNH2 substrate instead of using it as a redox cofactor. 1. Giedyk M, Goliszewska K, Gryko D. 2015. Vitamin B12 catalysed reactions. Chem Soc Rev. 44: 3391-3404. 2. Roth JR, Lawrence JG, Bobik TA. 1996. Cobalamin (coenzyme B12): synthesis and biological significance. Annu Rev Microbiol. 50: 137-181. 3. Campbell GR, Taga ME, Mistry K, Lloret J, Anderson PJ, Roth JR, Walker GC.2006. Sinorhizobium meliloti bluB is necessary for production of 5,6-dimethylbenzimidazole, the lower ligand of B12. Proc Natl Acad Sci U S A. 103: 4634-4639. 4. Collins HF, Biedendieck R, Leech HK, Gray M, Escalante-Semerena JC, McLean KJ, Munro AW, Rigby SE, Warren MJ, Lawrence AD. 2013. Bacillus megaterium has both a functional BluB protein required for DMB synthesis and a related flavoprotein that forms a stable radical species. PLoS One. 8(2):e55708. 5. Rickes EL, Brink NG, Koniuszy FR, Wood TR, Folkers K.1948. Crystalline Vitamin B12. Science. 107: 396-397. 6. Smith EL, Ball S, Ireland DM. 1951. B12 vitamins (cobalamins). II. Neutral, basic and acidic cobalamins. Biochem J. 52: 395-400. 7. Pollich M1, Klug G. 1995. Identification and sequence analysis of genes involved in late steps in cobalamin (vitamin B12) synthesis in Rhodobacter capsulatus. J Bacteriol. 177: 4481-4487. 8. Romero E, Gómez Castellanos JR, Gadda G, Fraaije MW, Mattevi A. 2018. Same Substrate, Many Reactions: Oxygen Activation in Flavoenzymes. Chem Rev. 118: 1742-1769. 9. Yu TY, Mok KC, Kennedy KJ, Valton J, Anderson KS, Walker GC, Taga ME. 2012. 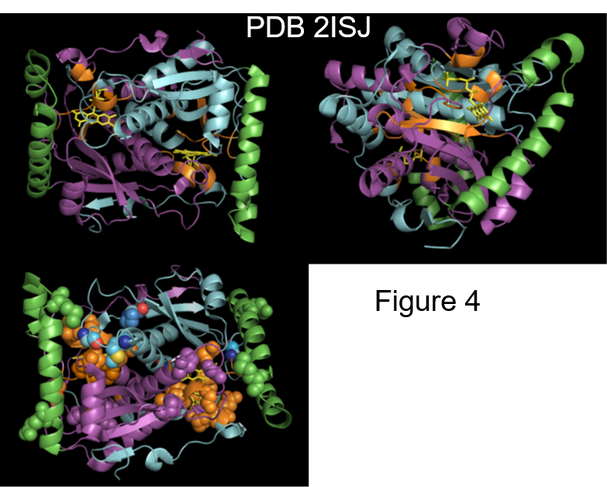 Active site residues critical for flavin binding and 5,6-dimethylbenzimidazole biosynthesis in the flavin destructase enzyme BluB. Protein Sci. 21: 839-849. 10. Taga ME, Larsen NA, Howard-Jones AR, Walsh CT, Walker GC. 2007. BluB cannibalizes flavin to form the lower ligand of vitamin B12. Nature. 2007 446: 449-453. 11. Hazra AB, Ballou DP, Taga ME. 2018. Unique Biochemical and Sequence Features Enable BluB To Destroy Flavin and Distinguish BluB from the Flavin Monooxygenase Superfamily. Biochemistry. doi: 10.1021/acs.biochem.7b01193.